Early model GEM Cars where fitted with with wet cell, or flooded type deep cycle batteries that need to be inspected monthly to add distilled water. 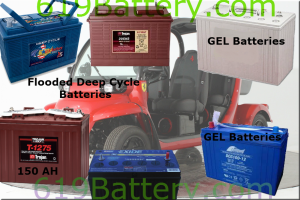 Later, around 2005 GEM opted for the deep cycle GEL battery chemistry that is maintenance free. 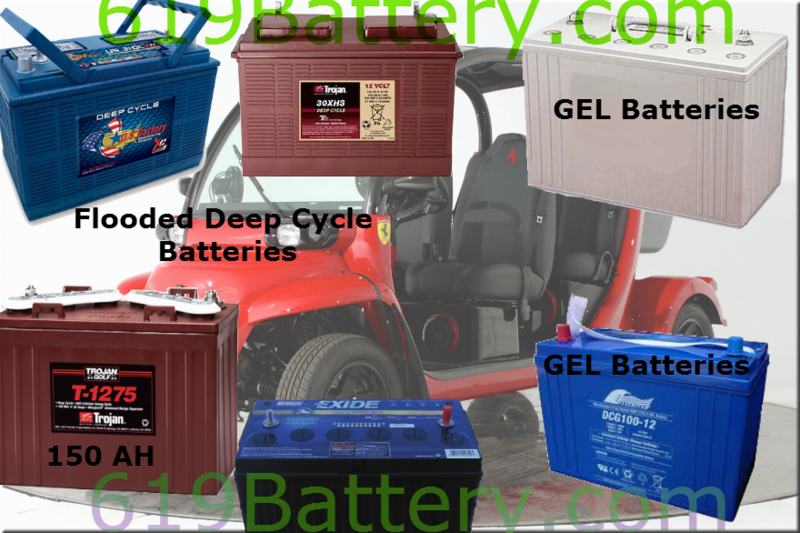 GEL GEM Car batteries are liquid free, survive deeper discharging and do not produce the corrosion traditional GEM Car batteries do. A GEM Car is a low speed vehicle that is battery-electric and street legal in nearly all 50 states on public roads posted at 35 mph (56 km/h) or less. With a top speed of 25 mph (40 km/h) GEM cars have a range of up to 30 miles (48 km) on a full battery charge. 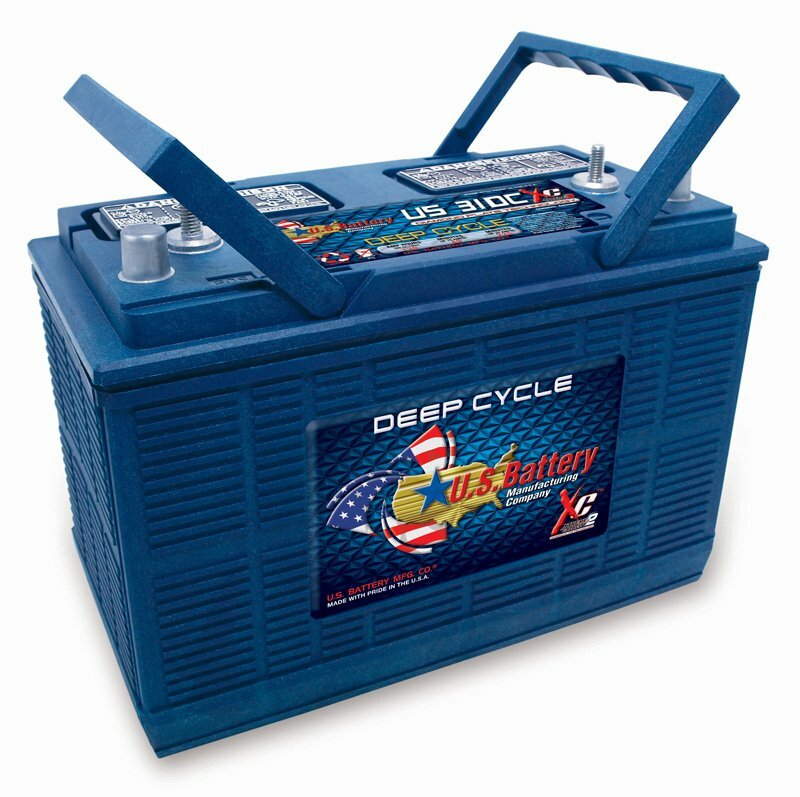 They are powered by six, 12 volt deep cycle batteries connected together in series to achieve a 72-volt battery system. Recharging the six batteries at once happens by plugging into a standard 110-volt outlet for six to eight hours. There are currently six different models of GEM cars on the road today. GEM cars are used by local, state and national government agencies, resorts, master-planned communities, universities, medical and corporate campuses, as well as by sports teams, taxi-shuttle services and individual consumers. There has been over 45,000 GEM Car’s produced since 1998. GEM eS NEV — A two-passenger vehicle with a 39″ x 48″ flat bed with and a 330 pound cargo capacity. GEM eL NEV — A two-passenger vehicle with a 70″ x 48″ flat bed with and a 700 pound cargo capacity. GEM eL XD NEV— An extra-duty heavier duty version of the GEM eL with a 70″ x 48″ flat bed with and a 1,100 pound cargo capacity. Local GEM Car Battery Installation in San Diego Available Starting at $65 flat rate. Local San Diego Delivery free for two or more. Also available to San Clemente, Dana Point, Orange County Area for a fee. Early model on-board chargers were Zivan . Later model Gem Cars have Delta Q 72 volt chargers. Both must be set or programmed to match the battery you are installing. 1. Use a dedicated outlet to charge your Gem Car. If you use a shared outlet, good chance the charger will stop charging when another appliance starts up. 2. Use a heavy gauge (12) electrical cord 25′ or less. 3. Charge frequently for as long as the batteries require. The on-board charger will shut off when fully charged. 4. Replace the OEM charger with a QuickCharge on-board charger when possible. 3. Do Not Trust the little green light on steering column. 4. Use a battery hydrometer to test flooded style batteries monthly for health and state of charge verifcation vs the little green light. 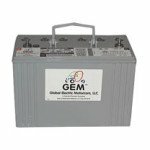 Low Speed Vehicle Battery Choice for Longevity by Professional GEM Car Technicians – Crown Battery 31DC130 Made in Ohio with the Highest Life-cycles. 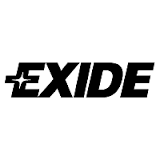 Don’t be mislead by inexpensive Costco or Walmart brand marine batteries that can leave you stranded. 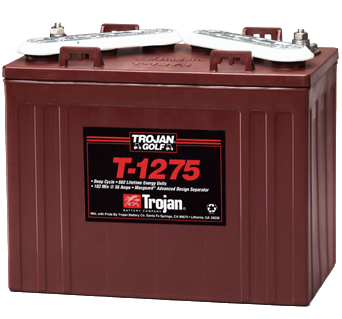 Only the Crown, US Battery, Trojan, FullRiver & Deka GEM Car batteries can offer industrial strength power and the most amp hours which means more driving range. New Crown 31DC-130 $159 ea with exchange. It’s about commitment. 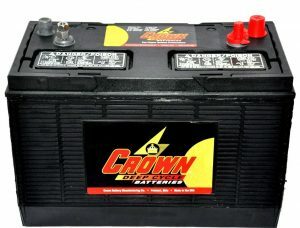 In everything Crown Battery does. From the raw materials they use…to the highest quality manufacturing processes and innovative product-development engineering…to the people that build, sell and provide the one-on-one technical support…at Crown, you’ll find there’s a total dedication to serving the customers who rely on their products and trust in the reliability of Crown. 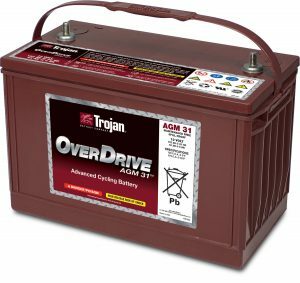 New Trojan GEM Car Battery Overdrive AGM 31 $199 ea with exchange. The Overdrive AGM 31 Battery fits right in the Gem car and can be used in both the two batteries in the front/four batteries under the seat configuration and all six batteries in the back. The on-board Delta q charger must be set to algorithm 5. 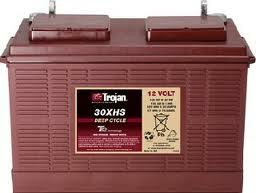 For Upgraded GEM Car Motors – Trojan Brand 12 Volt Deep Cycle Battery with More Capacity! The Trojan Black OEM Battery is Equivelent to the Trojan T-1260 12 Volt 140 amp hour. Perfect Solution for a More Capacity GEM Car Battery without Breaking the Bank! (Cores are required to void core charge of $30) Note, it is taller and is more difficult to install.. Additionally, the factory battery hold down hardware will not work. 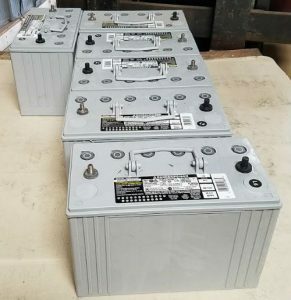 You must make changes to the battery hold down hardware as it as must to keep batteries secure! 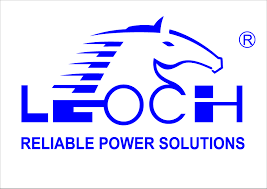 Leoch LPG12-100 AH Deep Cycle GEL Battery for GEM Car. 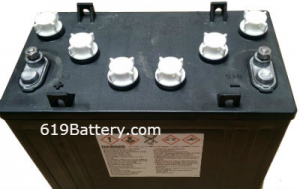 Replaces p/n 8G31 Gel battery. Gel batteries contain a gelled electrolyte which is “Thixotropic”. 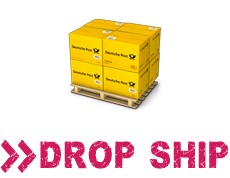 This Thixotropic gelled electrolyte contains sulfuric acid, fumed silica, pure demineralized and deionized water and a phosphoric acid. 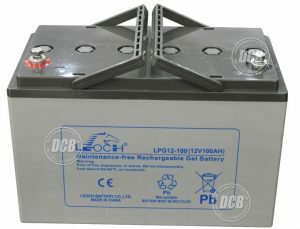 The electrolyte in Gel batteries does not flow like a normal liquid; it has the consistency and look of petroleum jelly. In AGM batteries, the liquid electrolyte contains high purity sulfuric acid and totally demineralized, deionized water (no phosphoric acid). This electrolyte is trapped in sponge-like glass mat separators.